Quotas for Women on Boards? Yes, Yes & Yes! I frequently find myself caught up in discussions, either on line or face to face, about quotas for the numbers of women on boards in the UK. I used to say rather tentatively that I reluctantly agreed with quotas in this case. But actually I have changed my mind. I am not reluctant at all. I categorically think there should be quotas and companies should be forced to comply! Industry experts agree businesses need to put more effort into developing female talent on the career ladder, but warn change will not happen overnight. Richard Emerton, head of board practice at Korn/Ferry International, agrees the female supply of candidates that fit chairmen’s requirements is limited. Chairmen generally want to hire people with profit and loss experience onto their boards, he says – those that have run major divisions within FTSE companies or who have experience as non-executive directors elsewhere. “The trouble with trying to find women is there are far more men who have profit and loss experience,” Emerton explains. The issue is not so much that there aren’t capable women – but that they don’t fit the required mould. 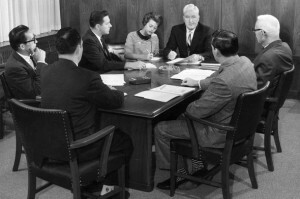 An annual study of boardroom gender by the Cranfield School of Management said there had been a “significant move in the right direction” since publication of a report by Lord Davies a year ago. There are now 141 women holding 163 board seats in FTSE 100 firms, while the number of companies with no women board members has fallen to 11. Out of 190 new board appointments in the past year, 47 were to women, the research revealed. Professor Susan Vinnicombe, co-author of the report, said: “The past 12 months have seen a significant amount of global activity around diversifying boards. After a decade of incremental increases in the UK, we are pleased to be reporting improvements that are more substantive. “If the momentum we have seen since the Lord Davies’ review continues we could achieve 30pc women on boards in less than four years, which would be a terrific achievement. That is brilliant, very good news, and I don’t decry it at all. The threat of legislation has moved businesses to act and find these women that previously were deemed not to exist. But I fear that once the pressure to change is removed the impetus will be lost and the status quo will prevail. If it’s not a problem finding suitable women now why will it be any more of a problem if legislation is introduced? If something is right, it’s right and should be a right. Right? No quotas for all the dirty, dangerous jobs then? No? Didn’t think so – just the cushy, high paying ones in the city. 100% of fishermen, sanitation workers, sewerage workers, roofers etc. can be men and not a single voice of descent from the feminists. We’re just disposable slaves to you lot, aren’t we. Came here looking via another page while looking for information on Natalie Bennett of the Green Party… well done, you’ve swayed me. Won’t be voting for them. Well, you certainly feel strongly about quotas. I’m assuming that’s a no, then? You are very wrong in your assumption that I consider all men slaves. It is possible to hold the opinion that there aren’t enough women in power and be a feminist without hating men. It’s an interesting point though,about manual work. I have long been a passionate advocate about women being able to do traditionally male jobs, as you’ll see if you read The Feminist & the Firefighter. The underlying question is one of where the power lies and wanting to change that bias. Heavens, it’s possible that we might even agree on the unfairness of how our society is governed by a white male elite. As for your comments on the Green Party, that’s up to you. I did not write that post as a promotion for the Green Party, more a promotion of my strong belief that women should be more equally represented within positions of power and then we might see some significant changes in society.